The highlight of the 1st quarter came off of an alley-oop from Kyle Lowry to DeMar DeRozan around the five minute mark. Kyle threw a long pass while he was at the top of the key and DeMar flushed it down with his left hand. This play got the fans into the game and brought energy to the bench, which proves to be vital in every game. Serge Ibaka's huge block on Caris Levert also brought tons of energy. Ibaka and DeRozan combined for 19 points in the quarter. Although the Nets forced 4 turnovers, that wasn't enough for them to cut into the lead. Toronto led the Nets heading into the 2nd quarter 30-20. 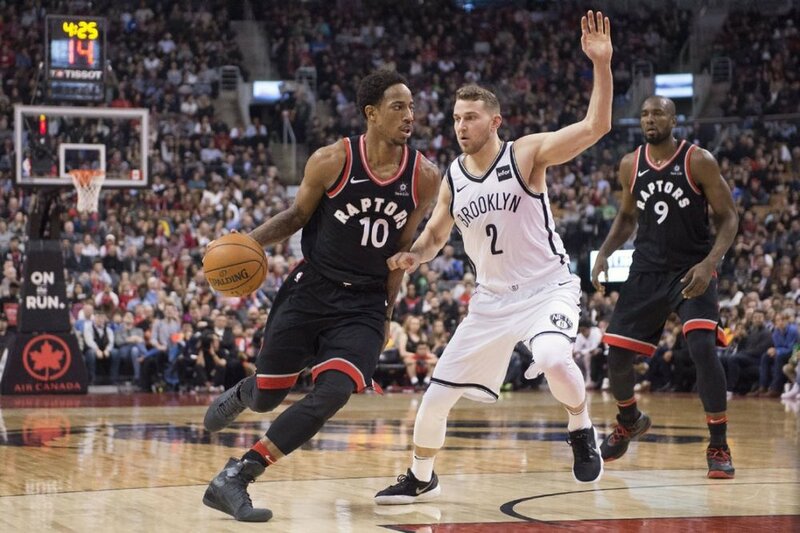 The Raptors struggled to contain Nik Stauskas in his Brooklyn Net debut, allowing him to score 12 points in the first 4 minutes of the quarter. Jonas Valanciunas and DeRozan answered back by scoring 14 combined points. DeMar hit a pull-up jumper with 2.8 seconds left on the clock, which gave Toronto a 58-44 lead to end the first half. Kyle Lowry was on pace for a triple double after recording 6 points, 5 rebounds, and 7 assists. After scoring 4 points and notching 5 assists, Kyle Lowry was just 1 rebound away from a triple double to end the 3rd quarter. DeRozan dropped 11 points in the quarter, which helped give the Raptors a huge lead. Ibaka also had a big quarter in which he scored 7 points and 5 rebounds. Toronto had a phenomenal third quarter, outscoring Brooklyn by 13 points. Going into the final quarter of play, the Raptors led the Nets 91-64. The Bench Mob played the majority of the final quarter, but Kyle Lowry was left in the game long enough to grab his 10th rebound and secure a triple-double. This was Lowry's 11th career triple double and he did it in a game where his team obliterated the competition. Norman Powell and Delon Wright scored 13 points combined, which sealed the assured win. The Raptors destroyed the Nets 120-87.